Late-season scouting important for identifying blackleg risk. Severe lodging from blackleg in an MR variety on tight rotation. Blackleg is one of the most serious diseases of canola in the prairies, and in some years may cause major crop losses. Through plant breeding efforts, the majority of canola varieties available today have built in resistance to blackleg, which is a very effective tool for its management. However, it is important to remember that resistance means disease tolerance, not disease immunity, and careful management is important. “Most canola varieties offer good genetic resistance for blackleg with either an R (Resistant) or MR (Moderately Resistant) rating,” explains Derwyn Hammond, Manitoba agronomy specialist for the Canola Council of Canada. “The resistance ratings currently available for commercial cultivars are based on their field performance in terms of disease severity and incidence relative to check varieties in disease testing sites.” Since the blackleg populations at most of these testing sites are likely still predominately from pathogroup 2 (PG2), which has been common in Canada for many years, it makes it difficult to predict how these lines will perform if faced with some of the different pathotypes that have recently been identified. The resistance ratings are converted to a percentage severity index for each line. The severity of blackleg infection is evaluated on a minimum of 25 plants per entry in each of four replicates after the plants are fully podded and just beginning to ripen. Plants are uprooted, cut through the stem at the site of the lesion or canker, and blackleg severity is scored for each plant using the following 0-5 scale based on the area of diseased tissue in the cross section. The severity scores must be ≥ 2.6 and ≤ 4.5. 0 – No diseased tissue visible in the cross-section. 1 – Diseased tissue occupies up to 25 percent of the cross-section. 2 – Diseased tissue occupies 26-50 percent of the cross-section. 3 – Diseased tissue occupies 51-75 percent of the cross-section. 4 – Diseased tissue occupies > 75 percent of the cross-section with little or no constriction of affected tissues. 5 – Diseased tissue occupies 100 percent of the cross-section with significant constriction of affected tissues; tissue dry and brittle; plant dead. Hammond notes that managing genetic tools well is critical because it is by far the most cost-effective way of managing blackleg in canola. Using R rated varieties consistently in tighter rotations creates the most selection pressure for more virulent races in the fungal population. This provides an opportunity for genetic recombination and the creation of new more virulent isolates of the blackleg virus, which eventually can become predominant in the fungal population. This is similar to the selection of resistance in weeds through repeated applications of a herbicide. 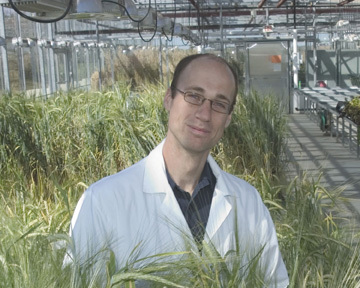 “Pathologists are very concerned about potentially losing the genetic blackleg resistance we now rely on,” he says. “In some parts of southern Manitoba with higher frequencies of canola in rotation, elevated levels of blackleg showed up in 2007 and again in 2008.” Researchers have also positively identified isolates from all four of the main pathogroups of the blackleg fungus in Manitoba in recent years. This, combined with the elevated blackleg levels, increases the potential for selection of more virulent isolates. Researchers are working with other countries such as Australia and France in trying to learn more about different resistance genes available in different cultivars and how those match up to the fungal populations. 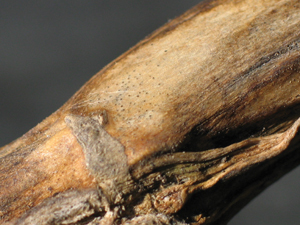 Look for picnidia on stem lesions to identify blackleg in the summer. Photos courtesy of the Canola Council of Canada. “Scouting canola fields throughout the season is important and will tell you something about the risk profile of your fields,” explains Hammond. “The genetic resistance has worked so well for so long that blackleg has almost become the forgotten disease in canola.” However, it has always been there, but at low enough levels that were not causing any issues. Although late-season scouting is too late to do much about the disease in the current year, the information can be beneficial in terms of future planning. It can help growers make decisions about the most appropriate crop rotation and variety for their farm and individual fields. Growers can either do the scouting themselves, or ask their crop scouts to include late-season scouting in their planning. Good management of genetic resistance tools and rotations will help growers manage blackleg disease in canola for the long term.